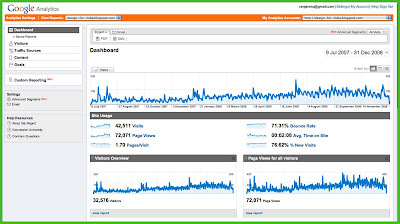 One and a half years on, looking back at the stats of visits, visitors and page views on the Design for India blog. Image 1: Graph of visits, visitors and page views on the Design for India blog over the past 18 months. As the year 2008 winds down with a sharp fear of worldwide recession that has been sweeping the global financial markets we have a chance to look back at the year that was in the context of this blog about Design for India. Design it seems is drawing growing attention from around the world and in particular Design for India has shown a growing trend in terms of visits, visitors and page views that have been clocked over the past 18 months that this blog and its visitors have been actively monitored across a few parameters of interest. Image 2: Visits to Design for India from 115 cities across India. The single largest block is from India and I am happy for that since it tells me that interest in design is growing in India and that internet users too are getting to visit a site about Design for India. However it is a bit disturbing that most of these visits are from the major metros although there is still an unaccounted set that could be coming from small towns these do not show up in the Google Analytics view of cities from which the traffic is seen. 115 cities in India have accounted for 23,878 visits and bulk of these came from Ahmedabad, Delhi, Bangalore, Mumbai, Chennai and Hyderabad. Going down the list of cities it is gratifying to see small towns in remote areas listed and we do hope that the message from this blog will reach more schools and workplaces across India where it really matters in the year ahead. Image 3: Visits from 52 regions of the USA. The second biggest block of visits comes from the USA and all 52 Regions have shown visitor traffic of 8268 visits and here California, New York, Illinois, Texas and Florida rake in the major share as the top five regions for visitors to the Design for India blog. These 52 regions include as many as 1943 cities with Los Angles and its suburbs, New York, San Francisco and Chicago contributing the largest number of visitors from the USA. 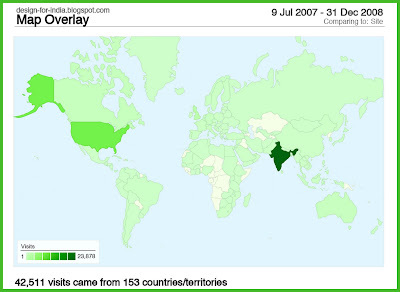 Image 4: Visits from 153 countries across the world with India and USA as top sources of visitor traffic to this blog. The worldwide picture is also showing some interesting statistics. 42,511 visits have come from 153 countries with India topping the list at 23,878 visits, USA at 8,268, UK at 1,738, Canada at 744, Australia 578, Germany, 480, France, 384 followed by Italy, Netherlands and Switzerland. The city count amongst the top countries are as follows: UK from 296 cities, Canada from 127 cities, Germany from 149 cities and France from 121 cities, and so on. The top pages visited are listed below and in all 72,071 page views have been recorded across the 105 articles posted on this blog over the past 18 months. We also wish that this kind of design use will be supported by sustainable models which is the theme for the World Economic Forum in January 2009 at Davos for which we have just concluded a series of workshops and charettes on sustainability through which we hope to reach out to the policy makers in industry and governments across the world. Design for India and design from India will, I hope, make an impact across the world in the days ahead. 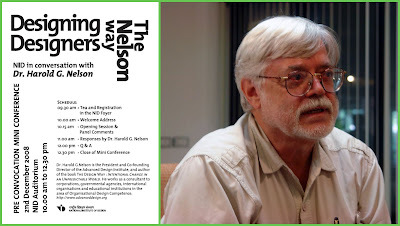 Image: Dr Harold Nelson at NID and the poster for the mini conference at NID. Most of my students are familiar with the book written by Dr Harold Nelson with Eric Stolterman, “The Design Way”, which is an amazing articulation of the various dimensions of design as we now know it to be today. Design for Nelson is an intentional activity that generates value. Design has changed and in order to explore the various dimensions of this change we decided to explore these dimensions in a mini conference for which we invited a panel of our teachers and juxtaposed it with the theme lecture by Dr Nelson. Image: Harold Nelson delivers the theme lecture and the panelists at the mini conference (L to R) Dr Nelson, Suchitra Sheth, M P Ranjan, Shashank Mehta and Chakradhar Saswade. "Our ultimate desire is to encourage and promote a design culture… A design tradition requires the enabling presence of a design culture, one that defines conceptual expanses and boundaries, and provides a context for setting particular limits on any design project. Such a design culture acts as a catalyst in the formation of social crucibles essential for sustaining the intensity of design action." 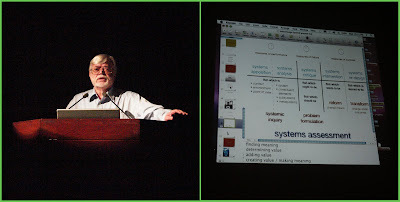 Image: Dr Harold Nelson with his models for Systems Assessment: from apposition and analysis, through critique and interventions leading to change through delibrate re-design, adding meaning and creating value. One of the ways in which we are engaged in the development of a design culture in India is through our models for design education. 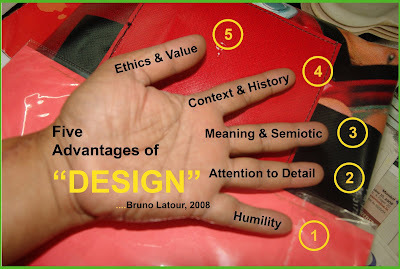 One task of design education is the designing of designers themselves: building the character and competence for design. The other is the awareness, development and recognition of design competence in other streams of education and in society at large. Both of these are essential to the creation of an environment that can help us realise the potential of design action. There are a variety of inputs and many possible approaches in each of these tasks. There are also perspectives that design education must take cognisance of: social development, sustainability and macro economics, among others. The panel discussed some of these issues, and their views on design education for a creative society set the tone for the Q & A session that followed. Image: Dr Nelson with students at the NID’s Product Design studio. This led up to the theme lecture by Dr Nelson after which we had lunch with a group of faculty colleagues at the NID Guest House. The post lunch session had Dr Nelson meeting the students in a huddle in the Product Design studio and a lively session went on late into the evening since the Nelsons, Harold and his daughter Autumn, were leaving for Delhi early the next morning. Image: The Design Museum lecture hall before the event. Prof Ranjan and Denis Cherdantsev in the foreground with Ou Ning from China and George Pegasiou of the British Council, London in the background of classic Eames wire chairs that were set up for the audience. The morning session of the Design Cities Debate started with a visit to Bush House in London for a scheduled interview for BBC Radio along with Deyan Sudjik, Director of the Design Museum. Mark Coles of the BBC conducted the interview and set the tone for the discussion on the Design Cities Debate that had been set up by the exhibition at the Design Museum in London later in the day on 15th December 2008. The full interview as it was broadcast on Tuesday, 16th December 2008 can be listened to at this link here (BBC interview link page) and those who wish can download the interview as a QuickTime file from this BBC interview download link here. Andrea Kidd was the producer at the BBC who had spoken to me in the preliminary tele-conversation that explored the scope of the discussions at the final interview and Mark Coles sat with the visitors in the small recording studio around a round table while Andrea could be seen through the glass wall while she managed the recording console on the other side. The Strand – Tuesday page Go to archives and look up the 16th December , Tuesday page to listen to the broadcast. The Design & Architecture team at the British Council had proposed this event to the Design Museum and it was through the support from the British Council in London and India that I managed to travel to London to participate in this exciting event. Image: Denis Cherdentsev from Russia and Prof M P Ranjan from NID Ahmedabad at the Design Museum terrace garden facing the Themes River with a view of the Tower Bridge and Norman Fosters famous Gerkin in the background view. The British Council and the Design Museum in London had an exhibition to promote at their establishment located on the banks of the Themes River in London. They invited four designers and design thinkers from the BRIC nations to come all the way to London to a debate and each was asked to make a pitch about one selected city from each of their countries that had the most likely chance of becoming the next design city of the world. The Design & Architecture team at the British Council had proposed this event to the Design Museum and it was through the support from the British Council in London and India that I managed to travel to London to participate in this exciting event. Deyan Sudjik, the curator of the Design Cities exhibition at the Design Museum and it current Director had made a selection of eight points in time when the world was changed in some significant way through the use of design. These eight events happened in seven different cities around the world and in his argument it started in London with the Great Exhibition at the Crystal Palace in 1851 and returned to London in 2008 and in the intervening period shifted from Vienna 1908, Dessau 1928, Paris 1931, Los Angeles 1949, Milan 1957, Tokyo 1987 and then back to London in 2008. The exhibition has an impressive collection of designed objects from each city and from the era that they represented and these were supported by pictures of the designers and some other related prints and texts. I am however surprised that Scandinavia of the 1960’s has been overlooked especially the work of the furniture masters at the Copenhagen school. Another point that crossed my mind is that the exhibition was almost completely object centric and the processes that formed the intangible parts of the visible offering did not form part of the debate in its favour. I am sure Deyan Sudjik has his own logic for the choices made from the vast array of possibilities that could be argued, for and against a particular city or an era when design made significant contributions to the world. The exhibits included works of several other designers who were living and working in the specific contexts listed above and the return to London in 2008 included many contemporary designers who have made a mark in the artistic and commercial circles with their design offerings. The four architect/designers/journalist from the BRIC nations were asked to make a ten minute presentation each, back to back, followed by a rapid fire questions from the chair and the audience before the matter was placed before the whole audience to cast their vote to select the city of their choice based on their own reading of the four presentations. Ruy Ohtake represented Brazil and pitched for Sao Paolo as the next potential Design City. Denis Cherdantsev chose Moscow for Russia and Ou Ning offered Beijing as the choice from China while Prof M P Ranjan pitched for Bangalore, nay, Bengaluru as the next Design City from India. The audience trooped in at 7.00 pm on the 15th December 2008 and the debate began with the first presentation about Sao Paolo followed Moscow, Bengaluru and Beijing. This was followed by questions from the chair and the audience and the when the matter was put to vote at 8.30 pm, Bengaluru was the clear winner by a decisive margin followed by Sao Paolo, Beijing and then Moscow. 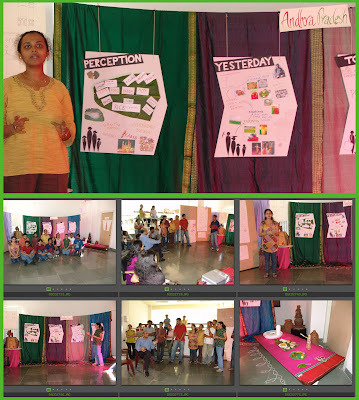 Systems models from Nature and people’s participation in a local Democracy were the highlights of the Bengaluru offering. The champions of the Bengaluru success are Poonam Bir Kasturi with her Daily Dump that promises to clean up the city through individual action motivated by the community and design scheme and this in turn promises to clean up the world when the design offering from Bengaluru is cloned in all the cities around the world just as the Bus Rapid Transit System (BRTS) from Bogota in Colombia is now being cloned in New Delhi and Ahmedabad and soon will reach Hyderabad and Bengaluru as well. The other example from Bengaluru was the Industree success story as well as the scaling up achieved by Ray + Kesavan and IDIOM through merger and acqusition processes with big business involvement and the small and big design studios that have been set up by our designers as models for others to follow. The full presentation made by Prof M P Ranjan has been linked for download on the previous post on this blog. 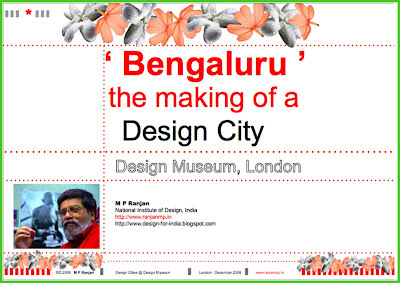 I am happy that the audience gave the thumbs up signal to the Design City proposal from India in the form of Bengaluru and I do hope that this message will sweep back to India where design policy and design action is languishing due to government and industry apathy over the years. We do need to get local politics to take charge of design in the local context and move the action from the objects of desire in the consumer industry space to the much needed public facilities and shared facilities that are so critical for the city to become a place with “The Quality without a name” which had been explained by Christopher Alexander in his book “The Timeless Way of Building”, a quality that can be sensed and not necessarily be seen. Bengaluru has all the ingredients to make this work and show the world that the next design city will celebrate a new kind of design that transcends the material and deal with the intangibles that make a difference in the world and in the minds and hearts to the people. The morning session on the 15th December began with an interview at the BBC at Bush House London the seat of BBC Radio that I used to listen to in my childhood days at Madras. Deyan Sudjik, Ou Ning and Prof M P Ranjan were interviewed by the BBC Radio team and the breadcast is expected later in the week and the schedules will be posted on the BBC World Service website. The next day in the morning a breakfast interview with the DesignWeek concluded our involvement in the series of Design City related events in London and their report is expected to be posted on the website here as well as in the print version of the magazine soon. This is a long story that for me hinges around the Indian National Design Policy that was set in motion by the Government of India on 8th February 2007. I was in the USA that very day at the Asia Society in New York that day with NID Graduates Uday Dandavate of Sonic Rim, Surya Vanka of Microsoft and Sudhir Sharma of Elephant Design to promote the “Design with India” initiatives in the USA and in India that started with the plans for the CII NID National Design Summit in 2006. We had traveled to the USA to help bring attention to Design with India and for the promotion of deep partnerships between designers, industry and policy makers that could make design a central capability that would be put to use in solving the many development issues that face India today. Uday had earlier invited me to speak at the IDSA Conference in Austin in September 2006 where I first met Elizabeth Tunstall – Dori – with her Mac connected to her blog live from the conference. My presentation at the IDSA Conference (pdf file 812 kb) was titled “Giving Design back to Society: Towards a Post-Mining Economy”. Dori commented on my paper (pdf file 42 kb) that day and we have been in touch since then on a new discussion list that she set up called the Design Policy List on Yahoogroups, now with many members. July 29, 2008: Is AIGA a labor union? 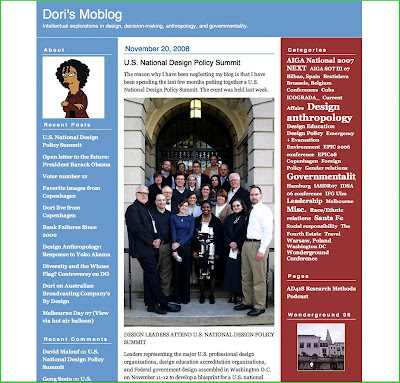 and finally the latest post that tells us about the status in the USA after the Summit organized by Dori with design leaders in the USA. Her latest mail to the Design Policy List is quoted below in full for immediate reference. We look forward to further developments on the USA and the ripples will most certainly come all the way back to India and help strengthen our own Design Policy initiatives here in India. So we pulled it off, the US National Design Policy Summit. Here is the official release, but I am very excited about the next steps, including the finishing the report. It was really cool to have this happen after the Obama election victory. It think it created an opening for participants to be focused more on the future and collaboration, two elements that were necessary for the Summit’s success. There is a lot a work that needs to be done, but it will be thrilling to do the work. Leaders representing the major U.S. professional design organizations, design education accreditation organizations, and Federal government design assembled in Washington D.C. on November 11-12 to develop a blueprint for a U.S. national design policy. - design thinking that advances the educational goals of all areas of knowledge. 7. Propose a holistic design award that will represent the highest honor in American design. I too have made a number of posts about the Design Policy issues for India and these links include 11 posts at the advocacy level and 24 posts that contain comments linked to the National Design Policy that I have made over the past one year. "The Gifted Eye of Charles Eames"
Image: Collage of Eames images from previous posts on this blog and some from the net about the Eames legacy in photography. Herman Miller, USA and National Institute of Design, Ahmedabad are sponsoring an exhibition of 100 images by Charles and Ray Eames assembled by the Eames Office from their vast archive to celebrate the centenary of Charles Eames. For NID this is a significant time as well soince it is the Golden Jubilee of the writing of the classic Eames India Report based on which the NID was set up in Ahmedabad way back in 1961. I will come back with details of the making of this exhibition and the story behind the picture after the exhibit opens at NID on the 20th November 2008. Eames Demetrios, the grandson of Charles and Ray Eames and the chairman of Eames office, will be there to show us the philosophy of the Eameses at a lecture at the NID Auditorium at 10 am on the 20th November 2008. The exhibition will be open to the public from 10.00 am to 6.00 pm each day from the 20st to 30th November 2008 at the NID Design Gallery. 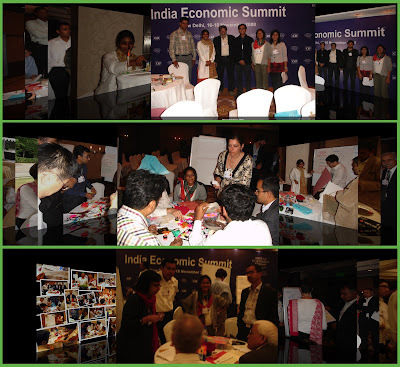 India Economic Summit, New Delhi as a venue for the First Sustainability Charette of the World Economic Forum. Image 01: NID designers Anand Saboo, Vishnu Priya, M P Ranjan, Praveen Nahar, Shreya Sarda and Mitushi Jain at the India Economic Summit’s Design Charette with world industry and expert participants across six groups that examined and developed innovative concepts and frameworks for sustainable futures leading to design opportunity offerings for many sectors of the consumer industry. 1. The Business Case for Sustainability. 3. Shaping the Framework Conditions. For the first time the WEF turned to designers in India and this brought them to NID, one of India’s leading design schools, to participate in the proposed Design Charette in New Delhi with students and faculty involvement along with a carefully selected group of lead industries and experts in sustainability to examine the issues and perspectives across several consumer industries in order to innovate and build prototypes and models for future sustainable practices and products and services. 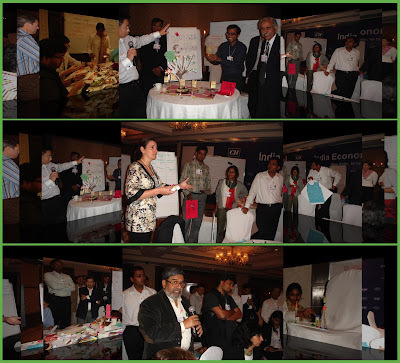 Image 02: Participants at the hands on Design Charette set up by the World Economic Forum team with Deloitte consulting at Taj Palace Hotel in New Delhi on 15th November 2008. The six groups looked at six broad product categories from the future sustainability angle to examine resource constraints, regulatory and policy implications as well as possible design opportunities that the situation offered to take stock of the current and future trends and make sensitive offerings at business process, product design and behavior change levels that may need to be addressed by businesses as well as governments of the world. The charette was a stimulating learning setting for all participants and it brought together designers from industry, social entrepreneurs, economists and experts all looking at the multi-dimensional problem of sustainability using systems thinking. I am pleased that we were involved in the first such event in New Delhi and we do hope that design will now be brought into the centre of our global search for solutions and through these we will build a sustainable future for all. The World Economic Forum’s initiatives are here at their website and I am sure more will follow as the work done in New Delhi grows to become a movement for the use of design across many geographies and sectors that are in search for sustainable models for the future. Image 03: Three Social Entrepreneurs shortlisted for the final award of 2008 making a presentation of their innovation concept and action on the ground. Rajat Gupta delivered the keynote lecture at the event. 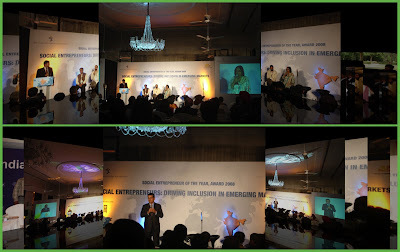 The evening event shifted to the Hotel Imperial on Janpath where the celebrations were on to felicitate the three finalists for the “Social Entrepreneur of the Year India 2008”. The Schwab Foundation for Social Entrepreneurship was started by the founder of The World Economic Forum, Klaus Schwab in 2000 and since then the process has identified and felicitated over 150 social entrepreneurs in 40 countries. A significant achievement by any standard. I hope that they will some time discover designers who have been working in the grassroots sector in India and elsewhere in the years ahead. I remember the group of girls in my DCC class of 2001, who were telling us that they had discovered the way to eliminate poverty using start-up entrepreneurship and they called it the “Baadal” strategy, named after the Indian Monsoon, which picks up good practices from all over India and rains it back over the population just as the monsoon does. They have been working at it for a few years now, in refining their concept and in building their own individual capabilities across many attributes that are needed to deliver the action on the ground and I am sure that in a few more years they would deliver what they had held out as a concept to all of us at NID during their concept presentation to the public which we called the “Concept Mela”. We need more such concept melas and more designers joining the action on the ground in the days and years ahead. These Design Charettes do much the same thing with the participants, small attitude change which would lead to the big sustainable actions in areas where they work and live in the years ahead through design and leadership that they would provide to those around them. Image 1: Micro view of the poverty alleviation strategy called “Raindrops Strategy” to use crafts as a vehicle for local empowerment and occupation building with design strategies and innovation as drivers of a new economy. IICD’s new incubatee programme coiuld adopt these groups and individuals for a sustained programme of contact and faciloitation in the field as well at the back end at the Institute as part of the Crafts Incubatee programme that may be funded and supported by a consortium of supporters, venture capital funds as well as Government Grants in Aid programmes. Learning from the field and giving back to the field is the proposed model for sensitive action using design sensibilities and innovation strategoies which will help build credible models for action and tested strategies for going forward with larger investments from the support basket. At each stage of this proposed ten stage model the IICD teams and their partners in the field would create intermediate products such as feasibility reports, crafts documentations, resource maps, opportunity maps and new prototypes and strategies for future action. These would be evaluated and rolled out under various schemes for support in the field as well as crafts and entrepreneurship training programmes. This programme will work in tandem with the existing Crafts Design, Technology and Management education programmes of the Institute. These individual forays are here called the “Raindrops” since the intention is to drop these into existing crafts clusters and allow these to grow as ripplies in the fertile ponds of our land. 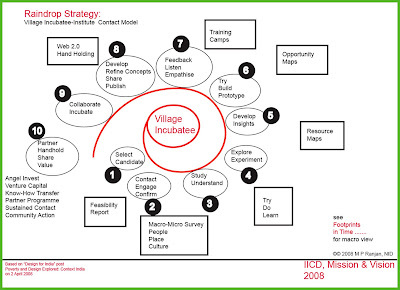 Image 2: Macro view of the empowerment strategy that could be used by the IICD to reach its growing knowledge and the human resources called the Agents of Change to various crafts clusters across India through a strategy called “Footprints in Time” as shown in the model above. The micro model called “Raindrops” can be replicated through an active support programme of incubation by the replication of the strategy across multiple locations and crafts clusters across India. This would be based on a growing resource that would leverage the crrent and future programmes of the institute as well as support the proposed programme for crafts incubation which would have a field front end as well as an institute based back-end programme of a specific duration. Using Web 2.0 strategies the IICD could build a community of designers, experts, partners and wellwishers with the crafts incubates to make an interactive support platform that willl grow and divesrisy over time. This process of maturation and growth is what I would call the “Feetprints in Time” model for the IICD action in the field support for the crafts incubatee. This concept has been expaned in a previous post on this blog on 3 November 2008 called “Footprints in Time: A Crafts Ecology for India" and another post on 18 October called “Mission and Vision: Crafts Ecology for IICD Jaipur”. These would set the stage to herald the arrival of the Creative Economy across the villages of India and help them face the intense influences of globalisation with the use of sustained local creative action. M P Ranjan: A Propsal for the IICD, Jaipur as part of their Vision & Mission explorations. 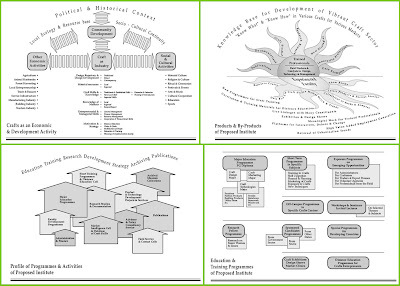 Image 1: Systems model for the proposed Crafts Ecology for India as part of the IICD, Jaipur’s Mission and Vision articulation in 2008. 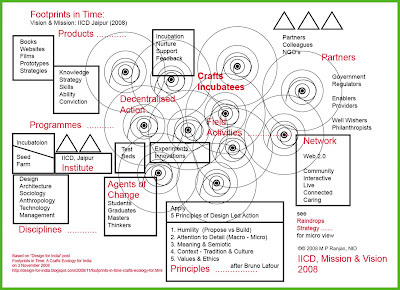 Further to my post titled “Mission and Vision : Crafts Ecology for IICD Jaipur” that was shared with our colleagues at the IICD, Jaipur on 18 October 2008 I have had some time to ponder and expand the ideas expressed in the model that I call a Crafts Ecology for India. We hope that the activities at the Institute and the collective actions of the Institute and its partners and stakeholders along with the wider collective of crafts persons, incubates and entrepreneurs all working in concert with the enablers and providers would achieve a sustainable local action in each chosen area and make a real impact over time. This model needs to be elaborated and designed in its finer details as we go forward and invest time and resources to make it happen. We invite those convinced to join the team at IICD, Jaipur and help realize these potentials, which we do believe are real and palpable. I came across a remarkable paper by Bruno Latour, the French Sociologist, titled “A Cautius Prometheus?” *full title given below. And I was mighty impressed and I purchased all his books from Amazon, I now have t read them, but the insights that he brings about design at the broader level I have not seen these held by many designers nor design professors, and we have much to still learn about design. The full paper is available as a pdf file 152 kb size from here. More about Bruno Latour from wiki here. A Cautious Prometheus? 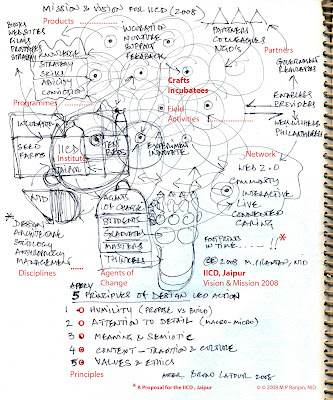 A Few Steps Towards a Philosophy of Design (with Special Attention to Peter Sloterdijk) Keynote lecture for the Networks of Design meeting of the Design History Society Falmouth, Cornwall, 3 September 2008 by Bruno Latour. download pdf 152 kb. 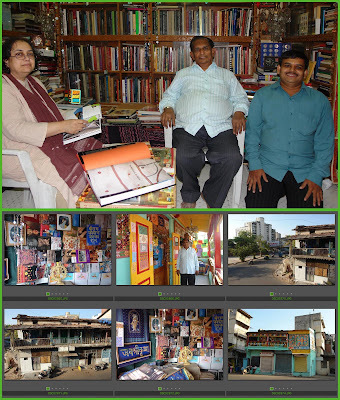 Image 1: The Art Book Centre at Madalpur village in Ahmedabad and its founder at the balcony with book jackets and artworks on display. A quaint and endearing bookstore in Ahmedabad has more titles of books about Indian textiles, art and design than most places that I have seen in India. Located at Madalpur village in the heart of Ahmedabad city in the Ellis Bridge area, it is a specialized bookstore run by a dedicated father and son team who perhaps know more about what has been written about Indian textiles and handicrafts than most scholars of the subject, and this is due to their commitment to locate and collect all available books in their field, old and new, and make them available to those who seek knowledge about Indian textiles, art and handicicrafts. Shri Manohar Patel, founder of the Art Book Centre and his son Shri Ketan Patel are seen at all book exhibitions dealing with art and design books and their first floor bookstore is a feast for the hungry book lovers looking for the subject of Indian art, textiles and handictafts. Accessed through a steep and narrow stairway, their first floor shop is decorated with colourful graphics, Torans (traditional Gujarati buntings) and book jackets from a wide range of publishers, with Mapin taking the lion’s share of shelf space. Image 2: Aditi Ranjan signing few copies of Handmade at the Art Book Centre with Manohar and Ketan in their shop. It is therefore no surprise that they were the first to carry stocks of “Handmade in India” and reach them to NID, the local libraries as well as NID faculty and students who have gobbled up the first batch of 100 books that reached them last week. Shri Manohar Patel tells me that he is picking up the next consignment of 100 books later this week, immediately after the long Diwali holidays get over in Ahmedabad. Aditi and I were invited to sign a few books for their regular buyers and collectors who keep in touch with them from all over the world. 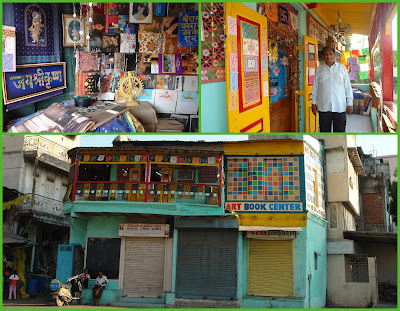 The Art Book Centre has been around for a long time and it is one of the must visit places in Ahmedabad on the list of most textile design related tourists to the city. They have an interesting and informative website and also respond to emails and can be reached through their contact info provided below. They have a particularly good reputation for mailing books overseas in a good condition but the book is heavy at 3.5 kg apiece and the postage too will be pretty heavy as a result. Image 3: Product information from the previous posts on Design for India as well as the Mapin 2008 Catalogue. 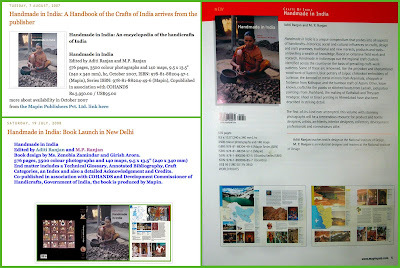 The “Handmade in India” is marketed by Mapin Publishers Pvt Ltd, Ahmedabad on behalf of the COHANDS and the Development Commissioner of Handicrafts, Government of India who are the publishers of the book. Mapin has included the product details in their recent brochure and the product details are given below. Image 4: Aditi Ranjan and M P Ranjan at the Art Book Centre signing event on Sunday 2 November 2008. 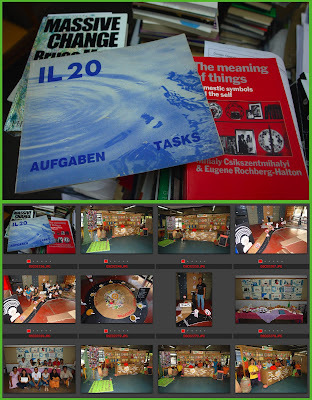 Image 1: Cover and a sample page from IL 20 Tasks by Prof. Frei Otto and his team. I have long admired the vision and the power of visualization that is represented in the series of publications that came out of the Institute for Lightweight Structures in Stuttgart under the leadership of Prof Frei Otto. Of these great publications numbered from 1 to 41, one stands out for its audacity and brilliance, and this is the IL20 simply titled “Tasks”, (Aufgaben – in German) and it was produced in 1979 as the 20th in a series of outstanding books that captured the research agenda of the school and the founder, Prof. Frei Otto himself. 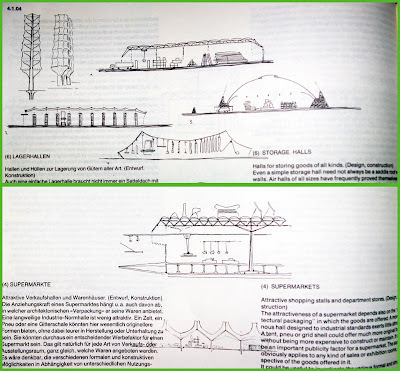 The origins of this comprehensive research agenda date back to the early 60’s with the publication of two books “Tensile Structures” and in the Newsletters of the Development Centre for Lightweight Construction in Berlin where Frei Otto had already made numerous sketches and suggestions for lightweight structures long before they appeared in practice and in the field. These visualizations were the forerunners of things to come and by their very presence they managed to mobilize support from a wide variety of partners and research enthusiasts who would otherwise have not been able to appreciate the finer aspects of the proposals contained in the Frei Otto thesis. The sketches make the proposals comprehensible and credible and is I believe far more effective than long texts of arguments in favour of or in a descriptive mode about the proposed area of lightweight structures. Image 2: Expressive thumbnail diagrams that appear in the books by Frei Otto in the IL series from 1 to 41. In May 1976 Frei Otto set out the outlines of the book titled “Tasks” and Jurgen Hennicke took up the challenge of articulation and compilation in the end of 1976. With the IL team getting into “Brainstorming mode” in the early 1977 and based on these sustained dialogues Frei Otto developed a “Work Programme” that included a list of 100 subject suggestions that could be the focus of the IL teams well into 1990’s. The “Work Programme” that appears in pages 306 to 317 is richly illustrated with the famous thumbnail images so characteristic of all the IL publications, in pen and ink style, crisp and expressive of the concept and manifesting a particular form that most represented the prototype of the concept that was being discussed, and in this case 100 subject areas. The IL 20 is then an elaboration and extension of these 100 subject areas that Frei Otto intended to research over the next twenty years, all spelt out in great detail to draw in partners from a host of disciplines that would be needed to carry out this complex set of research tasks in any meaningful manner. Unfortunately this section in only in German while the rest of the book is bi-lingual to include English texts with the images. Image 3: IL 20 Tasks as a source of inspiration for the Design Opportunity mapping assignment in the DCC course conducted by the author at NID. The very idea that one could draw the future had me rivetted and amazed when I first saw this book in the late 70’s. Since then I have been wondering why we do not use this as an approach to map out the design opportunities that lie all around us in India with its huge set of problems across as many as 230 sectors of our economy. I have since decided to introduce my students to this wonderful pursuit of mapping out all the design opportunities that are a product of their imagination in the form of expressive sketches and then in the form of more detailed scenarios as part of the Design Concepts and Concerns course and each batch we are able to address a particular sector of our economy and make a master list of all that needs to be done and sift out those that can be done with our limited resources, looking at both the possible as well as the viable, to further make a list of priorities that can be taken to the planners if we are given a chance to do so. In this process the students learn to do what we would call design thinking and action at the macro-micro level, that of building the future in the thumbnail sketches that lead on to the scenarios that each one of us holds dear in our imagination and helps build our conviction that stems from this very articulation of the possible and the realisation that something worthwhile is indeed possible in all this complexity around us. These thumbnail expressions help us map the contours of the ideas that are developed into scenarios where the fine tuning can take place through which we also develop our own convictions about its viability and we can identify strategies to make it work. Concepts which start off as being quite general are given a particular form through the medium of sketching and in this way they acquire a very particular manifestation as we explore and compare various alternatives that present themselves to us in the cycles of imagination and articulation that is the design journey. Image: The book release function at Rajiv Gandhi Handicrafts Bhavan on the 21st July 2008. 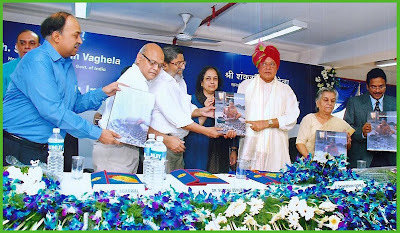 Shri Shankersinh Vaghela, Union Minister for Textiles, Government of India with Sanjay Agarwal, Development Commissioner of Handicrafts (extereme left) and Dr Darlie O Koshy (extreme right) at the book launch function. I met Bipin Shah of Mapin Publishers at the farewell lunch for Dr Darlie O Koshy that was hosted by the Chairman NID ‘s Governing Council, Mr Salman Hyder on 23rd October 2008 at the Fortune Landmark Hotel in Ahmedabad. He gave me the good news that the book was received very well at the recently concluded Frankfurt Book Fair with an order for 5000 more copies which I presume will be the second print run for the book which had still not hit the stands in India. He was not able to give me any indication of when the first print of 5000 copies would be available to the public since the Development Commissioner of Handictrafts had yet to take a decision on the marketing MOU with Mapin and the first print run that was completed in August 2007 was still lying in godowns in Delhi and in Ahmedabad. I do not know what happened overnight, since suddenly and out of the blue, the owner of the Art Book Centre in Ahmedabad, Mr N A Patel, arrived dramatically at NID on 24th October 2008 afternoon with 100 copies for sale to faculty and students of the Institute, finally breaking the silence in which the books were lying over the past one year and three months after its printing in Singapore. I hope to hear from both Mapin Publishers as well as from the Development Commissioner of Handictafts on the further availability of the book across bookstores in India, which I hope is quite soon. I tried to check out the Mapin Publishers website but it was a shame that none of the links worked and I hope that they fix that soon. I will report again on this blog when more information comes my way but I am quite relieved to see that at least some copies have found their way to the market after such a long wait. Perhaps NID should offer to carry stocks of the book in our publications department just as we had done for the Bamboo and Cane Crafts of Northeast India when the book was not available in any book store in India when it first was released in 1986. Do look out for the book in a bookstore near you and let me know if you find them on display in your favorite store! This should be a good Diwali after all the carnage on Dalal Street these past few weeks as the Sub-Prime financial panic spreads from the Wall Street to the emerging markets and this is significant since our book is intended to help our living crafts in India and the crafts community here to negotiate this tumultuous change through globalization and pave a way forward for our craftsmen to build a live and vibrant creative economy on the foundation of accessible information which can be our future if we set our mind and policy to realize what is possible with the use of Design in India. The second and third volumes that are still in production as well as the proposed web based initiative to follow all hold the promise of making the Hand crafts of India an accessible resource for the production of goods and services across the world through a creative reinterpretation that would be made possible by direct access to information and people in the days ahead. Prof M P Ranjan, NID, Ahmedabad (18 October 2008) Based on note prepared for the Governing Council at the IICD, Jaipur. Image: Models proposed in the IICD Feasibility Report (download pdf file 386 kb) to capture the tasks, objectives and processes through which these would be carried out. The Indian Institute of Crafts and Design (IICD) was set up in 1993 based on a Feasibility Report written by the NID, Ahmedabad. The Government of Rajasthan had placed its support for the creation of the IICD in Jaipur because of its promise to bring together three core capabilities of Design , Management and Technology for the development of the Crafts sectors of India. This is the first and only Institute that is mandated to develop knowledge resources and the “Agents of Change” who could make this happen in the field. The Institute has taken time to establish its foundations at the new campus in Jaipur and over the past ten years a credible education programme in crafts design has been established and the students of these programmes are showing their impact in various fields across the crafts sector. Now it is time to take stock and review directions as well as the changes in the macro-economic environment in India as well as across the Globe. Indian crafts is facing its most critical test of survival due to the massive change that is happening in the National infrastructure leading to huge displacements of population and loss of traditional occupations and unrelenting urbanization development. The focus today is still people as it was when the Institute was established and being a small organization in relation to the huge size and reach of the crafts sector in India the appropriate strategy would be to continue to build high quality catalysts who can act as the transformers in a growing circle of influence through research, design and direct field action. The Institute will need to expand its focus to include integrated services and know how across various areas of need that are faced by the crafts clusters in India and offer a single window of interface enabled through the “agents of change” who are the main products of the Institute. In addition to design and innovation the services that these agents should offer would now need to encompass social empowerment and confidence measures that would come from an understanding of business processes, finance and management literacy and access to real markets that can produce value to selected groups of crafts entrepreneurs who would form the second leg of the tripod offering. The Institute, in partnership with its main products the “change agents” will engage with numerous crafts entrepreneurs in the field to form an ecosystem of people and processes that would bring stability and creative renewal at all the centres that the Institute chooses to engage with, usually at the invitation of the various stakeholders involved. 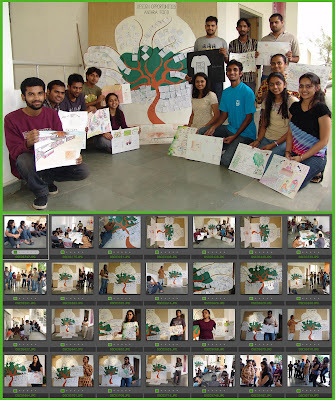 Therefore rather than looking at the students as completed products at the end of their education at IICD we would need to innovate community building systems using web based networking and rapid research feedback to create a living meta organisation of collaborators and a growing knowledge base. The institute will quickly need to initiate a direct contact programme with the crafts entrepreneurs drawn from numerous crafts clusters and through a formal programme instill in them the confidence and the abilities to work with the trained designers and technical experts who are the growing number of IICD graduates from its major education programmes. This new programme will have synergies with the main education programmes and the ripple of impact will grow with each batch of crafts entrepreneurs who return to their major clusters along with new ideas and an integrated set of tools to transform his or her landscape in his cluster while generating value for self and the community. They cannot act independently in the initial stages of their return to their clusters and it is here that we need to partner with development agencies such as the DC(Handicrafts) DC (Handlooms) and the Ministry of Rural Development at the State and Central Government level besides a host of NGO’s and Crafts based industries active in that particular region besides National and International philanthropic systems for support and sustanance. This ecosystem development approach should be refined with the building of working prototypes and in this way a small institute in Jaipur can make a huge impact in the transformation of vast sectors of our crafts based economy which is still a living resource across India today. We would need to review policies of faculty engagement and introduce liberal approaches to attract and hold high quality professionals from a number of fields including design, management and technology. The Institute must encourage individual and team based research and adopt web based methods of dissemination to help support a widely dispersed user base who would be the growing stakeholders of the Institutes offering. This effort would need to be an integrated region development initiative rather than just an effort to help a sustainable development model across diverse crafts activities all of which would require new knowledge and creative resolution to achieve both ecological as well as socio-economic sustainability models in each of these locations in an ever growing circle of influence. Staying small and flexible on the one hand and with a big reach on the other hand through the use of web based technologies and networks of field based collaborators for communication and research dissemination would be at the core of vision and drive the mission of the Institute going forward, particularly in the next ten years. 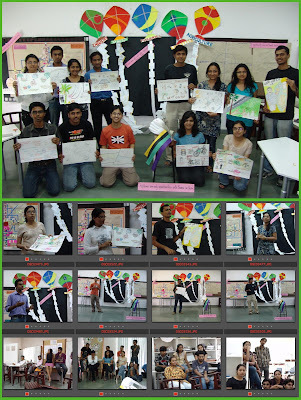 Image: The Karnataka group used a choreographed skit to tell their story of design opportunity explorations and shared their thumbnail explorations as well as the chosen scenario, both displayed as placards on their body. The front had the thumbs arranged, as a letter form while on their back was the scenario, which would be explained by their team adjacent member. This group missed categorizing the explored design opportunities using higher categories in their focus on the ideas created by the individual. Design Opportunities can be felt but not seen since they are a product of the imagination that is triggered by a particular perception or insight and these are nurtured by the designers conviction till it can be manifested in the world through the process of visualization, construction and operation. I am therefore not surprised any more when policy makers and the public alike fail to see value in a particular design offering till it is almost fully realized and placed on the market as a compelling offering and at an attractive price with an appropriate set of features. Design offerings take on a particular form and these can be easily differentiated through both deep and - or superficial transformations and compositions which is a strategy that companies use to make a range of offerings to meet a variety of price points and an equally wide range of feature sets to make for an active market where none exists. Image: The Tamilnadu group used a metaphor of a number of kites in the sky to map out broad areas of design opportunities in the fields of agriculture, industry, and fisheries and at the infrastructure and systems level of action. The thumbnail maps of the individual design opportunities were categorized and arranged along the string that held the kite in the sky and the developed scenarios came out of their group debates and identification of priorities. However most groups did not know much about agriculture and this was visible in the fewer design opportunities being identified for these sectors of collective ignorance, suggesting scope for additional research before these explorations are done once again. The format for exploration was created earlier this year when the DCC course was offered to the Foundation class in the previous semester and over the past few months we have given this format to each batch of DCC students at Gandhinagar, Paldi and at Bangalore and the results have been very encouraging indeed. Group and individual explorations can be bridged by making the design exploration journey a shared experience by giving the peer group a place in the process of design opportunity mapping and this reinforces the process of exploration through the strengthening of the expression through a process of peer discourse and sharing that would otherwise have not been encouraged in a design class that may be project driven and one that involves individual exploration. 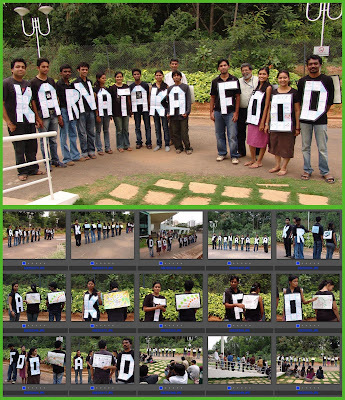 Since the group has a shared agenda to realize the best design opportunities with the focus of a chosen theme along with a given bias, in this case the theme is Food and the bias for each group is the chosen State – Tamilnadu, Karnataka and Andhra Pradesh – the process of articulation and choice making is both individual as well as group driven. 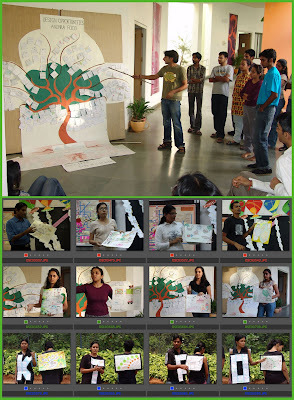 Image: The Andhra Pradesh group used the metaphor of the branching tree with its elaborate sets of deep and capillary roots, each part with a particular name, characteristic and attribute that mapped the real world attributes that the students found in their journey into the field during the previous assignment, The group was particularly successful in their exploration and as a group that were able to show a wide range of application areas and fairly developed scenarios for the particular design opportunities that came out of the group selection processes that they had adopted for their task. Numerous thumbnail images are created on the format provided and each image is supported by a brief write up that describes the salient features of the design proposal or as we call it the design opportunity. These are discussed and debated within the group as they emerge from the hands and minds of the individual creator of the images and these then may go through a further transformation with the incorporation of the feedback that is so critical for the design journey to get a bearing that is akin to the potential responses in the market place. However the conviction levels of the designer would determine whether or not the suggested changes are carried out in full or in part, if at all. The insights that led the designer to make this particular offering may not be seen or be visible to his colleagues which sets up a platform for discourse and debate and these processes at an important part of the conviction building process in design when it comes to making a decision, in favour or against a particular offering or a part thereof, of that particular offering. Image: Scenario visualization being shared by some of the students from each group as part of their final presentation of the DCC course at NID Bangalore campus. Students then select one out of many potential directions that are revealed in their design opportunity mapping and this choice is done in consultation with the team members. Each student then sets out to develop his or her chosen design opportunity and in the process sets out to build a visualization in the form of a scenario that would help articulate the particular offering, its impediments and potentials, the business models that would need to be considered to make it a success in the face of known and anticipated competition as well as a host of other factors that would deal with material, function, aesthetics, economics and other meta level criteria such as current and future legislation and the ethics of the offering in the context of society, culture and the ecology in which it is to be manifested eventually. This complex offering applies to all kinds of design situations and the design student is taken through these in the classroom long before they came face to face with these complexities in the field in which they are required to act. Image 1: Presentation by the Tamilnadu group in session at the NID Bangalore Centre. 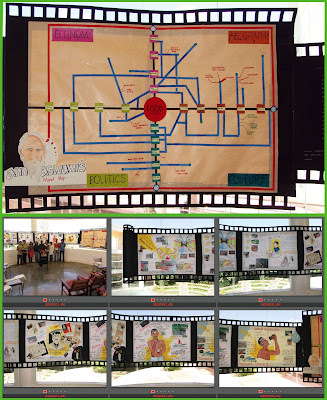 The group chose to build a flow chart of their understanding and the presentation uses a “story-board” that was represented like a film strip from the Tamil cinema story as shown in the illustration below. The storyboard was personified by the image of “Annaswamy” their man from Tamilnadu, from childhood to old age, and the food for all seasons brought into sharp focus by the overlapping threads of their story. The first assignment at NID Bangalore dealt with mapping ones own knowledge about food and each group had a particular bias from which their knowledge was to be mapped and shared with the rest of the class. As describer earlier this thematic bias plays a strong role on how the subject is addressed and it even shapes the perception of the situation and this was quite evident in the various interpretations that were exhibited by the groups, each working with Climate, Region and Culture, as their given bias for investigation and articulation. While I did not specifically tell the students that they were not expected to do elaborate research on their subject of food with the bias assigned to each group, they did not have the time to do such research and all the teams had to fall back on their well of knowledge that resided in their collective memories and from which they drew quite liberally through a process of brainstorming, categorization and articulation to show their models and constructs on the given subject FOOD – with the bias of Climate, Region and Culture. Image 2: The ‘story board” shown by the Tamilnadu group who used the persona of a young Tamil software engineer to represent their understanding of the chosen theme of “Food from Tamilnadu” shown here as a life time story, a journey from the cradle to a ripe old age, very interesting indeed. The Second assignment saw the groups fanning out to various places in Bangalore to carry out direct contact research in the mode of “anthro-design” with each group being assigned to a particular region State of South India. The assigned States were that of Tamilnadu, Andhra and Karnataka, each assigned through a draw of lots, which was done on behalf of the group by their student coordinator. The group members then went into a huddle and made a plan for gathering information and this information strategy played out over the next three days with the groups meeting and exploring Food and eating places in Bangalore, each looking at their respective State issues and trying to make sense of the vast field that could be covered by the omnibus assignment with very low definition and broad interpretation. As designers they were to investigate the subject directly from the field in live contact with ‘experts” and ‘stakeholders’ from whom they could get valuable insights about their assigned subject – FOOD from one of the three chosen States of South India. Image 3: The Karnataka group looked at the business of Food and explored the various dimensions of Karnataka cuisine as well as the typical resources of the State as they had discovered through their engagement with their contacts and eating-places across Bangalore city. 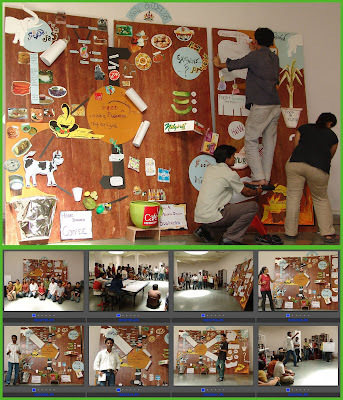 The Udipi café, MTR – “Mavali Tiffin room” and Café Coffee Day success story played strongly on the minds of this group and shaped the story that they had to share with the class through their wall size model and their mega success stories of food and the potential for a revolution from the State of Karnataka to the world at large. Their presentation was located in the basement workshop space of the NID Bangalore Centre and they impressed with their scale and sense of structure that was achieved in their model. Image 4: The Andhra group was shocked by the stories of poverty and distress that came from many of their contacts across the migrant labour now in Bangalore. Their installation, which is the appropriate term that can best describe the assembly of objects, sarees and posters that the group assembled to tell their story, was colourful and then filled with coloured light and everything turned red…. Making contact with live sources of informants in the field is so important for design students since it is important for them to learn that what they need is not knowledge of the kind found in books as much as getting a feel of the situation and in picking up specific insights that would give them a sense of direction and a glimpse of the way the trends shaped up in their area of investigation. It is here that anthro design as a subject area gets appreciated and some degree of competence is built up in handling such research where book based knowledge would certainly not fill the need. This kind of experience would be useful for design students and through these experiences they would also learn about research strategies to be used in the field and the whole range of processes of making contact, making observations, meetings and interviews as well as processing the rich data from the field in order to glean insights about latent needs and future possibilities are all critical for design education.